Animals are often the inspiration behind the creation and mechanisms of robots. 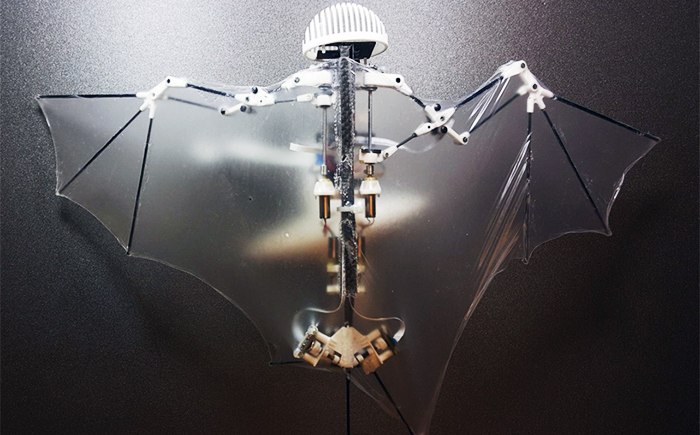 A team from the University of Illinois Urbana-Champaign and the California Institute of Technology has successfully mimicked the structures of bat wings and created a fully self-contained, autonomous flying robot called Bat Bot (B2). Bats demonstrate remarkable agility in flight, due to their ability to modulate the wingspan, wing cambering, and angle of attack using independently controlled joints. Weighing only 93 grams, B2 is shaped like a real bat and has silicone-based, stretchable membrane wings that best match the morphological properties of bat flight. 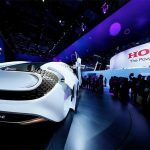 The robot is capable of changing its wing shape by flexing, extending, and twisting its shoulders, wrists, hips, elbows, and legs. The motivation for their research was twofold. 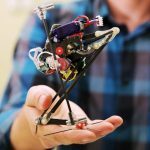 The study of bat flight provided valuable insight into flapping aerial robotics, and the design of these bat-inspired robots has practical applications for a safer human/drone environment. Many previous projects have focused on insect flight. The wing structure of most insects is not as sophisticated as bats due to their single, un-jointed structural unit. A bat’s powered flight mechanism is unique among other flying animals. Their flight mechanism involves several different types of joints (e.g., ball-and-socket and revolute joint) that interlock bones and muscles to one another, creating a metamorphic musculoskeletal system that has more than 40 degrees of freedom (DOFs). 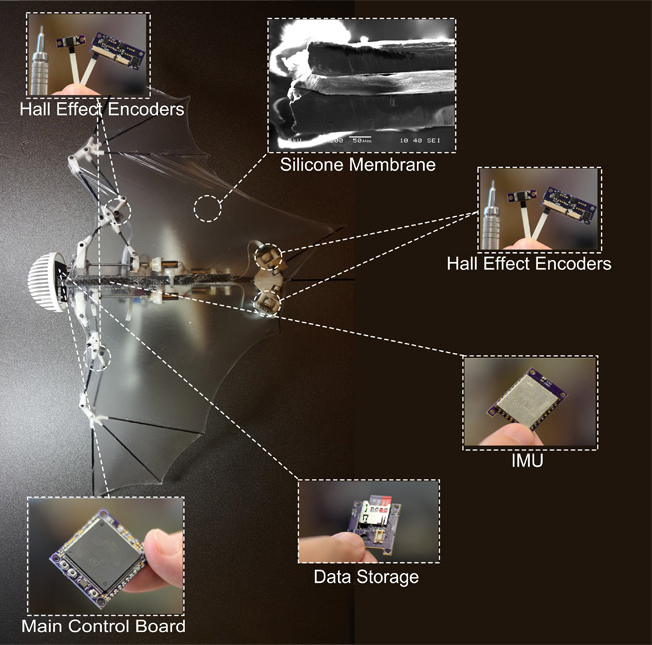 According to the researchers, these aspects of bat flight provides a unique perspective to winged aerial robotics. 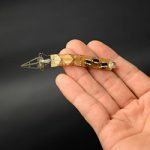 Bat-inspired aerial robots also offer a number of benefits over current aerial robots (e.g., quadrotors). 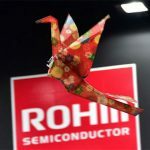 The biggest advantage of these robots is their soft wings. Traditional quadrotors and other rotorcraft are considered inherently unsafe for humans due to their materials and apparatus (e.g. sharp rotor blades or propellers) and high-amplitude noise. 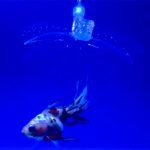 Robots with the pliable wings of bats, on the other hand, are comprised primarily of flexible materials and can flap their wings at much lower frequencies (7 to 10 Hz versus 100 to 300 Hz of quadrotors). These robots are considered much safer to operate and fly as they navigate through different environments, with little of causing any damage. The major DOFs in bat flight kinematics that were incorporated in the design of B2 were wing flapping, mediolateral movement of forelimbs, flexion-extension of fingers, pronation-supination of carpi (small bones connecting the hand to the forelimb), and dorsoventral movement of legs. These “biologically meaningful” DOFs enabled researchers to mimic the bat flight in much simpler design yet with the same functionality. Bat Bot’s flight mechanism consists of 2 wings (left and right), and each wing includes a forelimb and a hindlimb mechanism. The left and right wings are coupled with a mechanical oscillator. Using a crankshaft mechanism, the two wings can move synchronously and dorsoventrally. Each wing can also perform asynchronous and mediolateral movements. The hind limbs (legs) that influence the trailing edge of the wings perform asynchronous and dorsoventral movements. The forelimbs are composed of nine links or junctions: the humeral (p0-p1), humeral support (p1-p2), radial (p1-p3), radial support (p4-p5), carpal (p3-p4), carpal support (p1-p5), and three digital links (Figure 1; upper right). One of the unique characteristics of B2 is that it can be flown without a remote control. 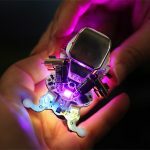 B2’s flight control is made up of its onboard sensors, high-performance micromotors with encoder feedback, and a microprocessor. While conventional fixed-wing MAVs are often controlled by thrust and conventional control surfaces, B2 has nine active oscillatory joints that require suitable allocation of the control efforts to the joints. B2 is composed of an onboard computer and multiple sensors for performing autonomous navigation. These electronics were custom-made especially for this self-sustained system and they are all equipped internally, meaning there are no external electronics on B2. MCB, located inside the head of B2, hosts a microprocessor and processes navigation-and-control algorithms in real time. Sensor data are acquired via a data acquisition unit, which is also responsible for commanding microactuators. The sensory unit, which consists of custom designed circuit boards with small form factors, interface with sensors and MCB by recording two kinds of measurements. An inertial measurement unit (IMU), located in the ribcage (where x-axis points forward and y-axis points upward), reads the altitudes of the robot with respect to the inertial frame. Five Hall effect encoders, located at the elbows, hips, and flapping joint, read the relative angles between the limbs with respect to the body. B2’s data flow diagram is shown in Figure 3. The microprocessor (STM32F429Zi) at the center communicates with a number of electronics, including an SD card, an IMU (VN-100), five Hall effect encoders (AS5048), and two dual DC motor drivers. Two 8-channel micro RC receivers for wireless communication (DSM2) and a Bluetooth device enables communication with the host or panel. Hardware-in-the-Loop (HIL) simulation was used to test the controller on the platform. 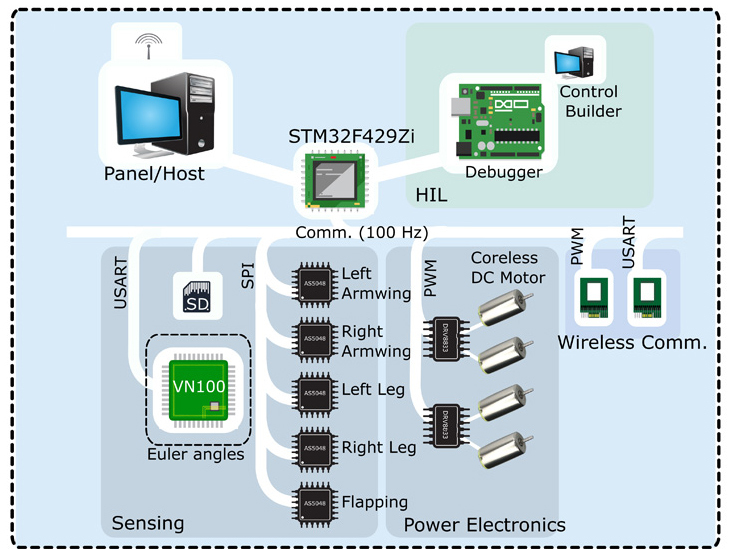 In HIL, the flight controller is embedded on the physical microprocessor and a real-time computer is used as a virtual plant (model) and it responds to the state of variables of the virtual model. The elastic network in the wing skin of bat was realized using ultrathin (56 micrometers) skin that covers the skeleton of the wings. Conventional fabric covering materials, such as nylon films, were not suitable for the body of B2, due to the restrictions of the forelimb and leg movements. As a result, the team used a custom-made, silicone-based membrane that is designed to match the elastic properties of real bat wing membranes. The team focused their attention on a few properties of the wing membrane, given that reverse engineering all of its characteristics was not feasible. They found the key features in the anatomical properties of bats’ biological skin to be 1) weight per unit of area (area density), 2) tensile modulus, and 3) stretchability. The current design implemented the major wing joints by means of a series of mechanical constraints and a feedback control design to control the six-DOF flight motion of the bat robot. Bats have complex musculoskeletal systems (i.e., multiple active and passive joints) which made it very difficult for the researchers to incorporate the joints in the design. Undoubtedly, B2 is one of the first steps towards the realization of sophisticated locomotion of bats. 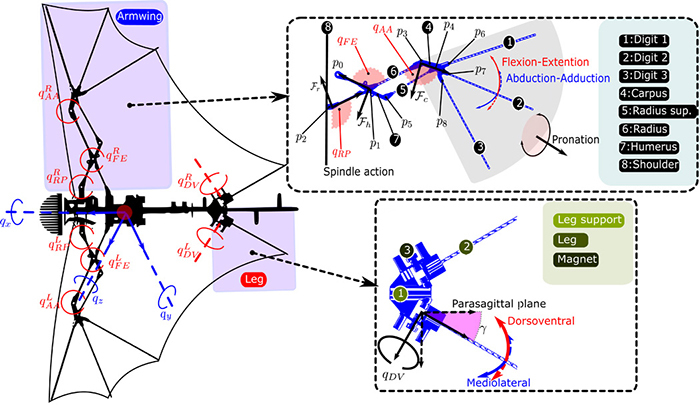 The model can contribute to further studying wing movement patterns observed in bat flight and reconstructing flight maneuvers of biological bats.